Locating ancestors from vital records (Census, BDM, etc) is its own reward, making genealogy fun and satisfying. But when searches are unsuccessful, when there’s someone in the family tree who eludes discovery despite years of searching, enthusiasm is difficult to sustain. One of my ancestors has been in the too-hard basket for about five years. Seminars and workshops and conversations with other genealogists had sensitised me to the possibility that I might not find him, or that there might be hidden clues – ‘breadcrumbs’ – that could mean the difference between success and failure in my search. Two lines of my family, the VanNaardens and the Parkers, immigrated to Canada between the 16th and 17th Centuries, when the North American continent was a vast border-less wilderness with isolated settlements along the east coast from the Carolinas to Quebec. These settlements in the wilderness comprised the descendants of British convicts sent to the American colonies from the prison hulks in the Thames, and immigrants fleeing religious intolerance and persecution in France and Britain. The earliest VanNaardens emigrated from Holland in the 1620s, settling first in Virginia and eventually migrating north to New Amsterdam (Manhattan) and New Jersey (Hackensack). The first documented Parker ancestor was born in Greenville, Lower Canada (Ontario) in the mid 1700s (the search continues for his forbears, probably English or Irish). Five generations later, a Vanidour married a Parker; that marriage gave me my maternal great-grandparents, Melvin John Parker and Ida Estella Vanidour (the VanNaarden surname had undergone several changes of spelling and pronounciation over generations including VanNorden, VanOrden, Van Ider and Vanidour, but the family connection over successive generations is not in doubt). Ida’s life was relatively easy to document. Melvin’s is another story. 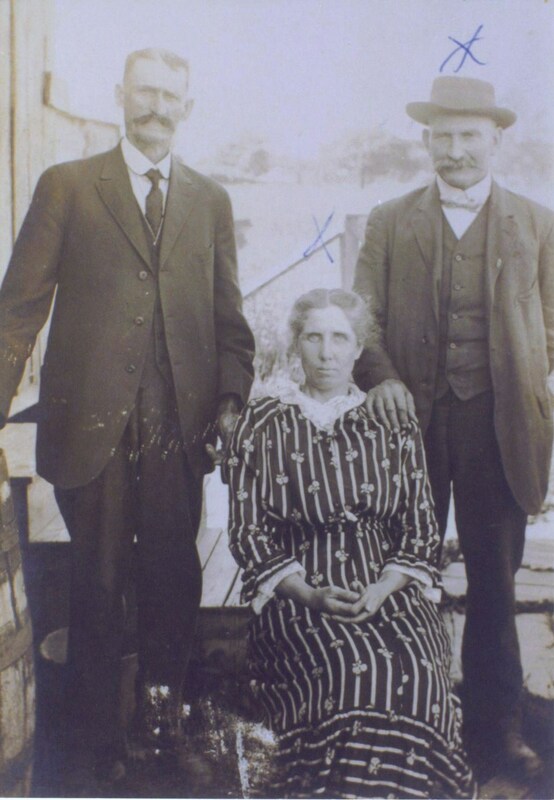 My mother and grandmother never spoke of him; there were no documents or records lurking in attics or trunks or family Bibles, nothing but an undated photograph of Ida Estella Vanidour Parker flanked by two unidentified men, one of whom might be Melvin. To add to the mystery, Melvin appears in the Canada Census for the first time in 1891, aged 24, a lodger in the home of the family Rusaloe – an avenue of research that turned into a dead end. Melvin’s marriage record to Ida later in that year gives his parents’ names as ‘George and Sarah Parker’. Ida died in 1903 and Melvin remarried and gave his parents’ names as ‘James Parker and Mary Ann’. Melvin seems to have been confused about his parentage but was in no doubt about his exact date of birth – 12 April 1866. 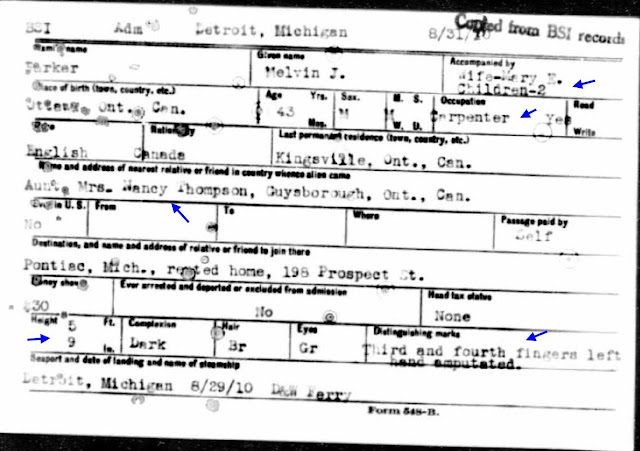 There is an immigration record from Ontario to Detroit, Michigan in 1910 that includes a physical description of Melvin: 5’9″ in height (about 176 cm), dark complexion, brown hair, ‘gr’ eyes (green? grey?) and a distinguishing feature – amputation of the third and fourth fingers of his left hand. The amputated fingers ought be enough to identify which of the men in the photograph is Melvin but, as luck would have it, the left hand of the taller man is obscured behind Ida’s right shoulder, and the shorter man’s left hand is behind his back. Someone has inked an ‘x’ above the head of the shorter man (someone with none of the sensibilities of a forensic genealogist! ); the inked ‘x’ suggests that he is Melvin, but I’m not taking any bets on it. Melvin has evolved into a man of such mystery that I’m quite prepared never to be able to positively identify which of the two gentlemen in the photograph is my great-grandfather. I was so distracted comparing the photograph with the physical description of Melvin in the immigration record that until just a few weeks ago I missed the first breadcrumb: information about Melvin’s aunt, Nancy Thompson, with whom he stayed in Guysborough, Ontario before immigrating to the U.S.
Aunt Nancy was definitely worth tracking down in an effort to identify Melvin’s birth family. Canadian census records revealed Nancy Parker married to Heathstone Michael Thompson, but searches for her birth family using the names on Melvin’s marriage records (Parker ‘George ‘ and Parker ‘James’) were unsuccessful. On a hunch that Nancy and/or one of her siblings or nieces/nephews followed Melvin’s path to Michigan, I checked U.S. Census and death records and found, quite by accident, another of Melvin’s aunts, Emma Parker born 1845 to John and Victoria Parker (not ‘George and Sarah’, not ‘James and Mary Ann’). Emma Parker was born in Ontario and died in Michigan. Right age, names of both parents…definitely worth researching further. Mary Ann Parker is the mother of Melvin Parker. Melvin said as much, at the time of his second marriage – which suggests that he may have been fostered or adopted from birth but had come to know his birth mother in the years before his second marriage in 1904. In the 1920 US Census Melvin aged 53 and his second wife Mary were living in Detroit with ‘Mary Ostrander’ age 73, ‘mother’ (of the head of household). Mary Ann Parker (fifth daughter of John and Victoria) did indeed marry John Ostrander in 1866. Melvin’s mother, come to hand at last! Mary Ann Ostrander married a second time, to Fred Hubert in 1922; it was under the surname ‘Hubert’ that I verified her death in 1930 in Presque Isle, Michigan. 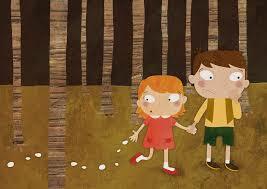 The puzzle is that no documents have yet been found to support Melvin’s existence before the 1891 Canada Census. If a birth record exists, it continues to elude me. The identity of Melvin’s father is unknown and will likely be the key to finding a birth record, but so far I have been unable to find a marriage record for Mary Ann Parker to anyone other than Ostrander and Hubert. The assumption is that Mary Ann was a single mother; she may have raised her son, or given him to another family (perhaps to one of her sisters). Whatever their relationship during Melvin’s childhood, he and his mother Mary Ann had a close enough connection for Melvin to have known about his aunt Nancy, and to have taken in the aging Mary Ann to live with him and his second wife in Michigan in 1920. Crumbs of information have further extended my maternal family tree and opened up a whole new avenue of research. Mary Ann’s father John Abel Parker was Mormon, and so far I have documented three of his wives and 13 more children. My eyes are peeled for more breadcrumbs. Fascinating story and certainly shows the benefits of attention to those small crumbs.